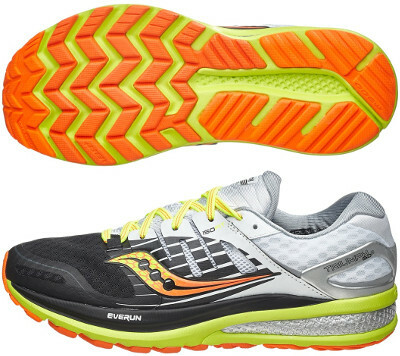 Saucony Triumph ISO 2 are neutral cushioned running shoes. The Saucony Triumph ISO 2 has been released (along with the Guide 9) in the first wave of Saucony's running shoes with new EVERUN foam. It promises more responsiveness and durability than well known EVA but it is still unknown how it performs without feedback from unbiased runners. The most cushioned Triumph ever also includes an extra EVERUN heel pad for improved shock absorption, ready to enjoy long distances. Upper in the Triumph ISO 2 has not many changes. It keeps ISOFIT™ system from its predecessor the Triumph ISO so the floating support cage sits like a saddle over the fit-sleeve, cradling the midfoot and moving with the runner's foot in motion. Something new is the light plastic clip around the heel to provide more consistency for better stability. The major change in the Triumph ISO 2 takes place in the midsole where new full-length EVERUN layer has been added on top (just below sockliner) for improved responsiveness and increased cushioning. PWRGrid+™ is still the main foam in the midsole while another EVERUN landing zone adds extra support for heel strikers. As a summary, cushioning is slightly firmer and more generous. Outsole has been completely redesigned as well with new TRI-FLEX configuration for improved flexibility and smoother ride. It is made of softer rubber (IBR+) in the forefoot to enhance cushioning and responsive ride and more durable carbon one (XT-900) in more exposed areas.